Saying goodbye to little ones that are off to their big school is always a very heart felt experience. Let us bring children and their parents together for this precious moment with an amazing LeapAlong party. Our team will host a leavers party in your venue – ideally, it should be a space where the children have spent some happy times and have grown to love. We’ll then set off on a magical adventure that will send them off on their next big step in life with a great big smile and happy memories. We’ll arrange all kinds of joyous games and activities for your leavers party, and there will be plenty of singing and dancing to keep spirits high! We will arrive half an hour before to set up at the venue, and we are happy to host children’s welcome parties for 1 hour for a maximum of 40 children. All our staff are experienced, caring and have an enhanced up to date DBS check. Our company has £10 million public liability insurance in place, too. Harry has grown in confidence through being at the class and Charna ensures she takes the time to understand the children and get the best out of them. The songs that are used are fun, educational and we find ourselves singing and practising every day. Both of my children have loved LeapAlong. 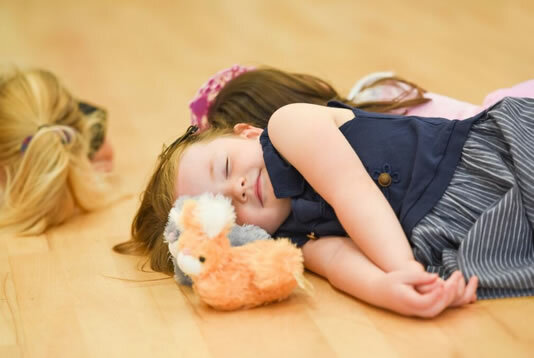 The combination of music, dancing, action songs and games means the children do not even realise they are learning – they’re just enjoying themselves! The alphabet, numbers, colours and phonics are all integrated into the sessions from the start and are slowly built upon in a fun and playful way. Betty and I have both adored every single session!! Thank you so much for all you have done to make Betty’s Friday mornings so entertaining and educational. I’m sure she’ll be reaping the rewards for many years to come.